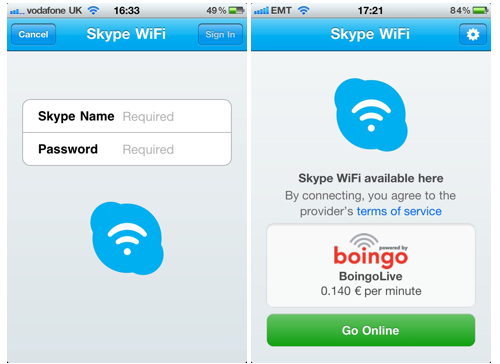 Today Skype WiFi app is released in apple store for iPhone, iPad and iPod Touch. It helps the iOS users to connect to over 1 million Wi-Fi hotspots around the world via their existing Skype accounts. To use the service you need a Skype account and purchase Skype Credit. The Skype WiFi app is free and available for the iPhone, iPod Touch, and iPad. Skype Wi-Fi costs start at 6 cents a minute, and the company is offering up to an hour of free Wi-Fi to those using the app on August 20th and 21st. Tap Go Online and you’re online! The company says the app is great for travelers all over the world, offering a cost-effective and simple way to get online with an iPhone, iPod Touch or iPad.